Daniel Craig and directors like Sam Mendes have done an exceptional job at reinventing James Bond with a grittier, more serious tone. As superb as some of Mr. Bond’s recent outings have been, particularly “Skyfall,” a part of us all will always long for the days when James’ adventures were full of excessive gadgets and one-liners. 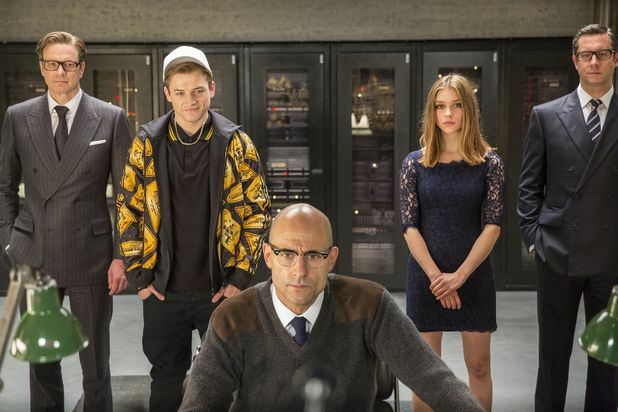 “Kingsman: The Secret Service” is a marvelous throwback to old school British spy thrillers. While an obvious homage to early James Bond, the film also adds a few modern twists with a self-aware sense of humor and colorful violence that makes “Hot Fuzz” look toned-down by comparison. Colin Firth is probably the last person that comes to mind when people consider the word, “badass.” If he proves anything here, though, it’s that he could have made for a terrific Bond fifteen or twenty years ago. While that ship has sailed, the 54-year-old Firth is still tailor-made to play the role of Harry Hart, a senior agent employed by an international intelligence agency known as the Kingsman. Rarely cracking a smile and delivering every line in a dry manner, Firth creates an endlessly witty character reminiscent of somebody out of “The Avengers.” For the record, I’m referring to the 1960’s spy series, “The Avengers,” and not Marvel’s mega-blockbuster. Harry sees great potential in Gary ‘Eggsy’ Unwin (Taron Egerton), the troublemaking son of a fallen agent who could do anything if he just put his mind to it. Eggsy is invited to fill a Kingsman position, but faces stiff competition against other potential candidates like Sophie Cookson as Roxy. Through arduous training involving flooded rooms and jumping out of airplanes, Eggsy and Roxy form a strong friendship that refreshingly doesn’t blossom into a romance. Of course they might be saving that for the sequel. “Kingsman” has no shortage of memorable supporting performances, including Michael Caine as the head of the secret organization, Mark Strong and a blunt trainer, and even Mark Hamill putting on his English accent as a professor. A movie like this is only as good as its bad guy, however. “Kingsman” finds a brilliant one in Richmond Valentine, a billionaire genius played by none other than Samuel L. Jackson. Although he might not seem intimidating with thick glasses and a lisp, this eccentric entrepreneur has an improbably devious plan to level off the human population. He’s aided by Sofia Boutella’s Gazelle, one of the most inventive henchwomen of recent memory with a pair of artificial legs to die for. Director Matthew Vaughn of “Kickass” was the perfect person to breathe life into this unique concoction, which is equal parts classic espionage adventure, living comic book, and loving satire. His latest film wisely never takes itself too seriously, but still keeps the audience emotionally invested when a major character is shockingly killed off. On top of that, the action is some of the most fast-paced and well choreographed in a long time, most notably a church brawl in which Firth introduces an army of religious fanatics to their maker. While not as graphic as “Kickass,” “Kingsman” still earns its R-rating and might prove a little too over-the-top for some. For everyone else, the film is simply a blast from start to finish. Nick Spake is a graduate of Arizona State University. He has been working as a film critic for the past ten years, reviewing movies on his website,NickPicksFli cks.com. This entry was posted in Nicholas Spake. Bookmark the permalink.